Kids just naturally want to dance! Camp Folkmoot! Kids just naturally want to dance and at Folkmoot 2018 they will be able to do exactly that – with the performers – at Camp Folkmoot! The one-day, all-immersive dance camp will be part of the Folkmoot 2018 Festival and is set for July 20! 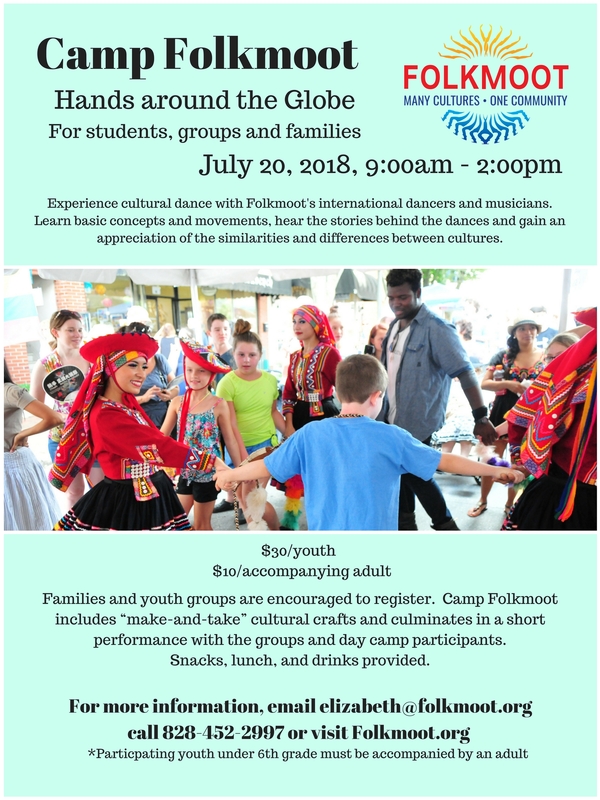 Dancers of all abilities ages 10 – 17 years who are inspired by dance and live music can learn international folk dance moves with the Folkmoot cultural ambassadors from around the world and visiting Waynesville to perform at the 2018 Festival. 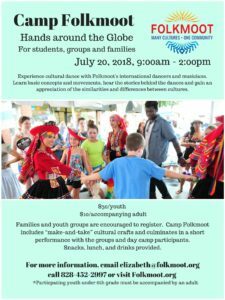 The campers will learn basic concepts and movements, gain an appreciation of the similarities and differences between cultures and hear the timeless, captivating stories behind the dances of each international group. The day includes “make-and-take” cultural crafts and culminates in a short performance with the groups and community participants. Families and youth groups are encouraged to register. Snacks, lunch, and drinks will be provided. Discounts are available to groups of four or more if registered together. Tickets for this event are $30 per camper and will include lunch, snacks and supplies. For more information, contact Elizabeth Burson, 828-452-2997. Parents and community are invited to attend the Final Group Performance at 1:30pm.